Phase 2 DMVPN network should behave like a LAN (if you’re not familiar with DMVPN watch the Phase 2 DMVPN fundamentals first). OSPF configuration is thus quite simple ... unless you forget to set the DR priority on the hub router(s) and one of the spokes becomes the DR. Watch the step-by-step OSPF-over-DMVPN configuration guidelines. Configure ip nhrp multicast-map for the hub on the spoke routers, otherwise the spokes will not send OSPF hellos to the hub. Use dynamic NHRP multicast maps on the hub router, otherwise the spokes will not receive its OSPF hellos. Use broadcast network type on all routers. You could use non-broadcast network type and configure the neighbors manually, but that would just destroy the scalability of the solution. If you use point-to-multipoint network type, all the traffic will flow through the hub router. Only the NHRP next hop servers (usually the hub router(s)) can send OSPF hellos to everyone. If any other router becomes DR or BDR, you’ll get hard-to-explain partial connectivity. Set OSPF DR priority to a high value on the hub router (so even if an under-configured spoke joins the network, it won’t preempt the hub). Set OSPF DR priority to zero on the spoke routers (this ensures they can never become a DR or BDR). The DMVPN part of your network should be a separate OSPF area; if at all possible, make it a stub or NSSA area (watch the Configuring OSPF in Phase 1 DMVPN video for details). 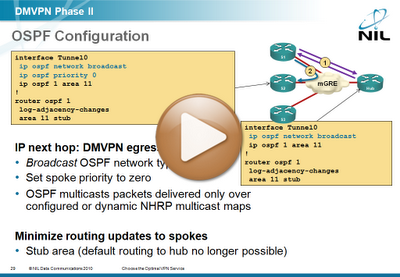 The Phase 2 DMVPN section of the DMVPN: from Basics to Scalable Networks webinar (register here or buy a recording) includes detailed OSPF, EIGRP and BGP configuration guidelines as well as numerous others topics described in the previous post.